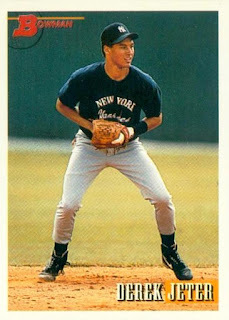 It's been a couple of years since the iconic New York Yankees shortstop has retired, but I've found myself looking for at least some of his rookie cards - to top off a 'micro-mini' group PC I've put together in my Top 30 PC collection. The Bowman isn't as nice [or shiny] like his 1993 Upper Deck SP card but at least at the time of release - maybe just a little bit harder to find than the his other lower-end, mainstream rookie cards i.e. Topps [have], Score [need], Upper Deck [have], Pinnacle [need], Select [need]. My Topps year-to-year run [1978-present] of cards for each MLB team has been a dormant project - but since there is still novelty in the 'newish' flagship cards for the year, I wanted to get 2017 out of the way. Though my run doesn't exactly go back to the 'vintage years' of the 50s, 60s and early 70s - I want to build a run of Topps cards from the past 35-40 years. A particular player may only be represented three times for each of the teams he has played for - someone who has played for at least a couple of teams can possibly appear six times, though my goal is to have a variety of players represented and not just a particular player. 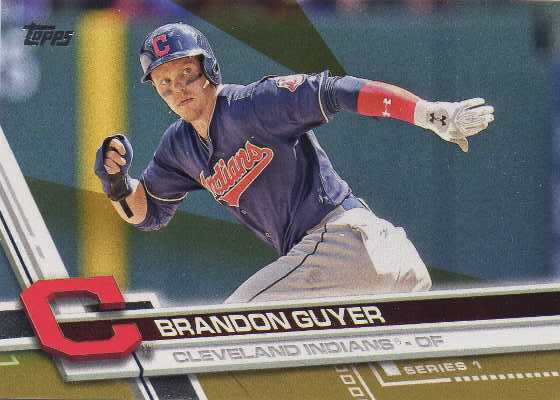 There might be some strategy in observing the 3X rule - where I might hold off on simply adding a no-brainer star player's card, maybe to save the spot for next year [or if I've used the same player's card seemingly multiple times in recent years]. 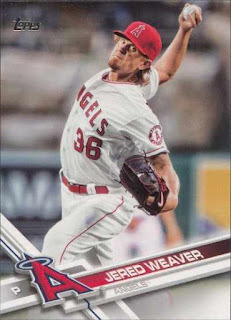 There might be some odd player choices but the idea is not doing too much work to create a run of cards featuring just strictly star players - at times I just want to use the cards I already have in my collection [especially, but not limited to the junk wax era years 1986-92] as opposed to being too picky when all I need is a random card to fill a hole. However, there will be ‘tweaks’ to include prominent players, players with the highest WAR for a particular team in a given year, the most photogenic cards, etc - it’s just no fun when I have no cards to chase after. I vaguely remember Elway sighing before signing this 1999 Topps card for me at a golf tournament - while there might have been chances to get a non-card item signed, I tend to be a 'card first' guy, so this was what I got scribbled on the last time I saw him. I was able to get Brees to sign this 2006 Upper Deck Rookie Debut card years ago and dug it out to be slabbed - a good thing is that the trading card lists and pictures [wish it was a game action image] Brees with a New Orleans Saints since he has been the face of that franchise for 11 seasons. 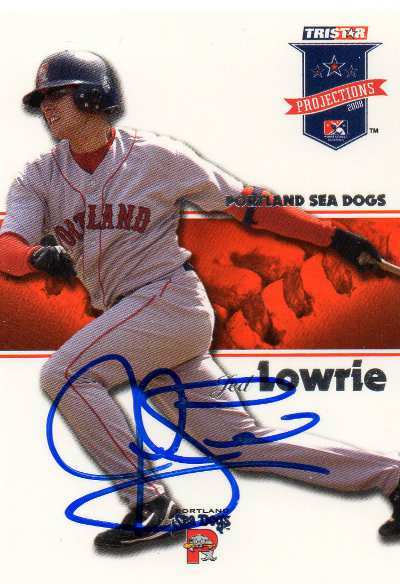 I primarily collect baseball, so my collection of signed IP/TTM cards from other sports just doesn't run as deep - though I may have something loose to dig for like these cards I thought might look good once authenticated and slabbed. I must have written Ward 10-15 years ago and I got my two cards signed - I'm not sure if he was a dominant player at his position on a year-to-year basis, but Ward was a longtime star and part of two Super Bowl championships with the Pittsburgh Steelers. Most of my 'pocket change' has been spent towards picking up magnetic card holders to upgrade storage for many of the individual cards in my PCs - I can only use top loaders and semi-rigids from 1999 for so long. 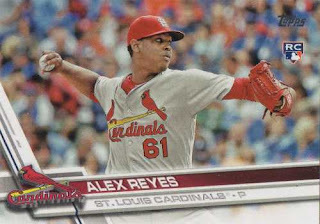 As is, I haven't really bothered to rummage through the cards in the quarter bins of my LCS - I have this ritual with these loose cards where I may grab a brick of them to start off with, but have to sort them out to where I only get so many cards. 2017 Topps Alex Reyes #103 - he’s had his share of prospect cards, but this is his Topps flagship MLB RC logo card. 2017 Topps Matt Strahm #274 - there are only so many players I end up hearing about, if they are more under the radar guys, than prospects hyped up by all sorts of experts. 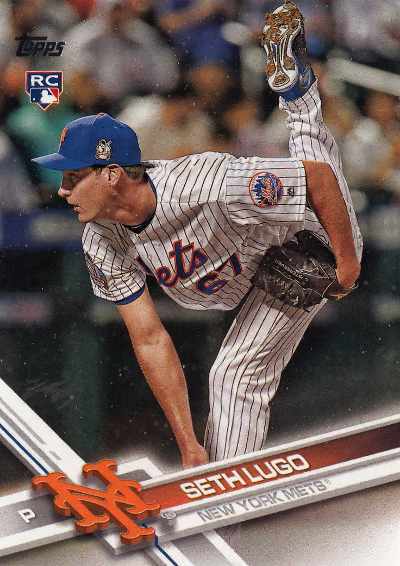 2017 Topps Seth Lugo #319 - vaguely heard of him; he was brutal in AAA Las Vegas in 2016, but then gave the New York Mets a shot in the arm after he first got called up. 2015-16 Upper Deck SP Authentic hockey Doug Gilmour #137 - I’m not a hockey card collector but I like cards with these types of images. 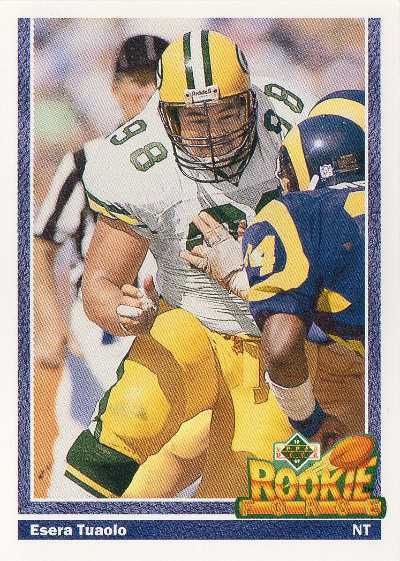 1991 Upper Deck football Esera Tuaolo #635 - I found this in some random Green Bay Packers box in the store and thought wasn’t this guy a packer of a different sort? I knew I was vaguely aware of him as a guy who did come out - so for a time his story was interesting post NFL career. 2016 Topps Heritage High Tim Lincecum #631 - he’s signing autographs here, though the image is cropped so that act is obscured...probably goes into my 'players wearing shades' mini-collection. 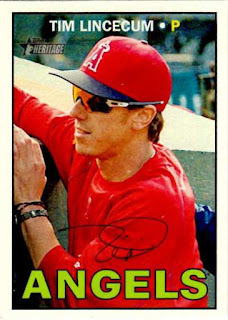 It's not like Lincecum lost his mojo overnight, but his comeback attempt with the Angels in 2016 was an absolute failure - after being such a dazzling pitcher in his prime, it's hard to imagine the reality of Lincecum being a has-been, relative to all his big league accomplishments. 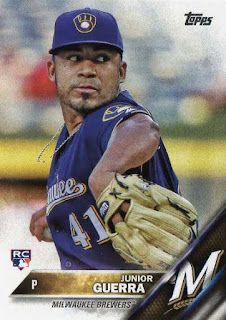 2016 Topps Update Series Junior Guerra #US124 - I found this card on a stack in one of the back counter of the LCS; I feel like it's my duty to pick up at least one card of a player I've never heard of before, even if I may not hear from them ever again. 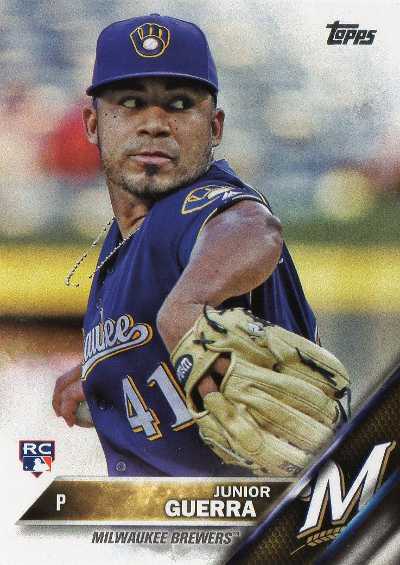 Guerra was a journeyman minor leaguer who finally made his big league debut at 30 in 2015 - however he started 20 games for the Milwaukee Brewers in 2016 and struck out 100 batters in 121.2 innings pitched while allowing only 94 hits. 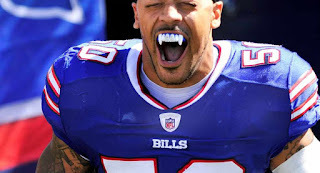 2012 Topps football Nick Barnett #174 - this maybe the last card that I may have ever thought about picking up, but isn't that something where it looks like he is wearing some fangs. 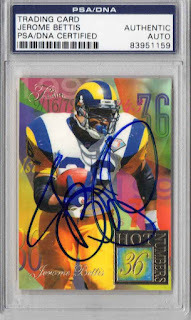 Bettis has a unique autograph where it looks like he writes out the 'Rome' in Jerome and then draws out a caricature of a football - maybe it was because I was getting him on a trading card and it wasn't a paid signing, but I didn't get any of those unique qualities. 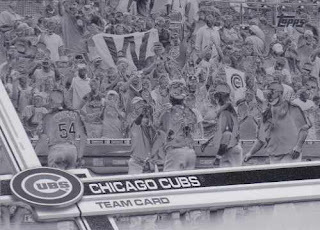 Though Bettis' autograph is a little messy, the scribble I got on a 1994 Fleer Flair Hot Numbers insert was definitely rushed - the autograph wasn't completely clean with just a bit of streaking and a blemish on the white part of his jersey in-between his number and his shoulder pads. 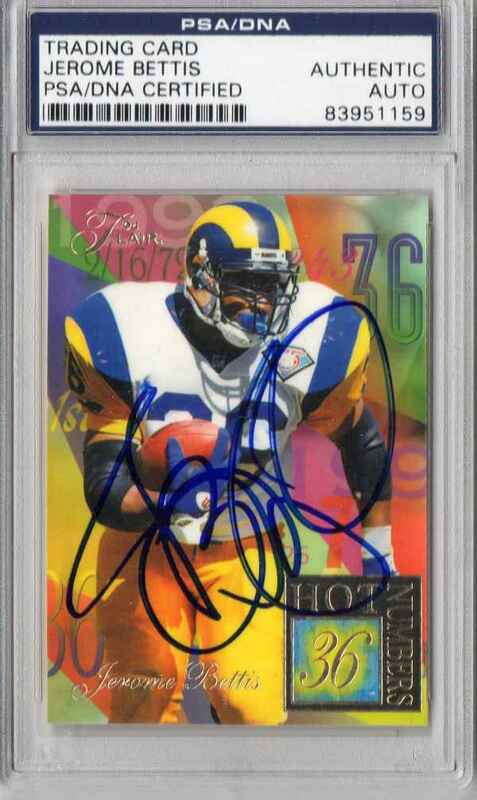 The slabbed PSA/DNA card ends up being a keeper in my autograph collection somewhere because I'm not into football collecting as much - where I'd try and find an actual certified autograph card [or non-card item]. The only non football autograph in my PSA/DNA submission was a TTM signed card of NBA legend Jerry West - it may only be a card I randomly sent at some point within the past 15 years, but I'm amazed it came back to me signed, because I've always associated The Logo as a sporting great who may not have signed autograph requests. 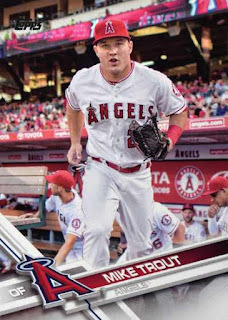 I picked up a jumbo pack of 2017 Topps Series I for my yearly breaking ritual of at least one jumbo pack of Series I, Series II and Update - with a nameplate eating up the lower portion of the front of the card and bright colored card backs, these flagship cards may take a little getting used to, but are otherwise passable. 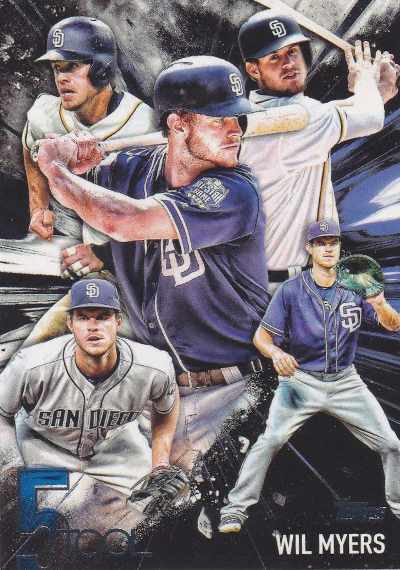 #5T-16 Wil Myers - Five Tool insert; I like these cards and while maybe too radical, wouldn't mind seeing the multiple picture in a collage element be used as a Topps flagship design instead of the more pedestrian looking base cards issued like usual. #230 Northern Highlights / Toronto Blue Jays - feat. 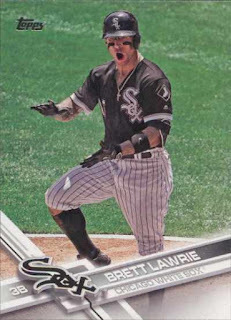 Tulowitzki / Saunders? I got this 1987 Topps second year card signed in-person by the Hall of Fame wide receiver at some public appearance - the card might have been a card show pick-up 15-20 years ago when I was more open into at least dabbling in collecting other sports. Though it was probably not worth much to begin with, I've always liked how the card looked and now that it has been slabbed - I'm pairing it with a PSA graded 1986 Topps rookie card I have in my PC. 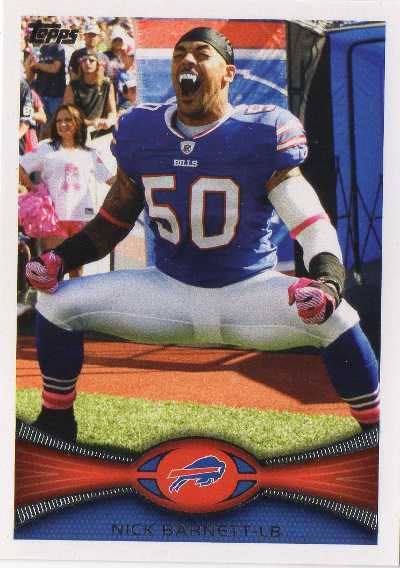 Owens was perhaps the biggest NFL 'personality / diva / me first' athlete in the past 20 years, but with all the drama, he forged a legendary NFL career as a wide receiver - the details are fuzzy, but I must have found this nice looking card of Owens and sent a request to him randomly TTM. I got my card back signed, though he used a black pen and on a card that was just too dark for any autograph to really stand out - for some peace of mind, I wanted to see if the card would be authenticated and slabbed. There was a package I picked up from the post office and I assumed it was my PSA/DNA order - since it’s really the only thing I’m waiting for in the mail. Inspired by at least several YouTube videos, I wanted to follow suit to see if I could put together a PSA/DNA submission of my own - PSA/DNA’s January / February special is 50% off football/basketball players and while primarily a baseball guy, I put together 10 applicable cards / items for authentication. I made a previous PSA/DNA order in 2013, though I'm still iffy about about throwing real money into something - that may be more of a subjective, arbitrary exercise. Perhaps it’s just that Tommy Boy guarantee, but there is definitely the lure of having something you got signed at some point slabbed - making those loose autographed cards in my collection a little nicer in general, knowing someone deemed an authority has passed my inked up cards as good. I’ve dreaded counting out the days left [I assume about 20 business days] before I realistically could look forward to receiving my order - so it was a relief it probably took only 10-11 days to go through. However I was a little anxious about the results - there was some excitement as it was fairly bigger box, though it was probably because I’d sent a signed 4x6 index card of Peyton Manning [TTM circa 1998] and either way, PSA/DNA needed to ship it back to me. I started working on opening the box - it was kind of hard to figure out where to cut through and open the box with scissors. I just hope it wasn’t for nothing where I’d see my Manning autograph tagged with an ‘N4’ sticker - when I finally opened the box and dug out the contents [in bubble wrap], it looked pretty good otherwise with the Manning kind of crooked in a big honking slab. 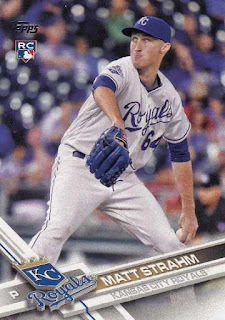 I'll see if I can get at least a post out of the other items that were slabbbed - there was one unslabbed card sandwiched between two pieces of cardboard with a rubber band, so that obviously was an ‘N4’ card, which is not good. N4s are something I may almost come to expect and reading going through posted results of logged in orders on the PSA forums - I think the ‘N4s’ are more interesting than the stuff that passes authentication. The ‘N4’ turned out be a Troy Aikman card, which I definitely got signed in-person and not something I got TTM or purchased - I realize regardless of whether it's signed by the subject in-person, if it doesn’t look ‘good’ or if it looks ‘irregular,’ then it will not be passed otherwise. Robinson spent 9 seasons in the big leagues and was a moderately successful relief pitcher - he signed some cards for me recently and while his signature is apparently just one lazy stroke, it's another for my Angels all-time autograph collection. 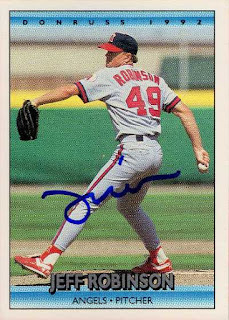 Through flipping through their junk wax era cards, I was vaguely aware there were two Jeff Robinsons that pitched from the 1980s through the early 1990s - Jeff M. Robinson, passed away in 2014. 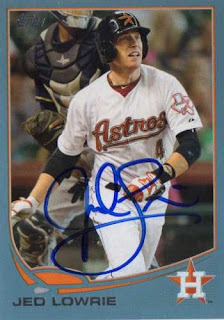 The Oakland Athletics infielder signed my two cards in blue Sharpie and kept the third card I sent - I saw he was pretty good about signing TTM, so I wrote to him c/o the Athletics [spring training] last year and eventually got a response back in January.